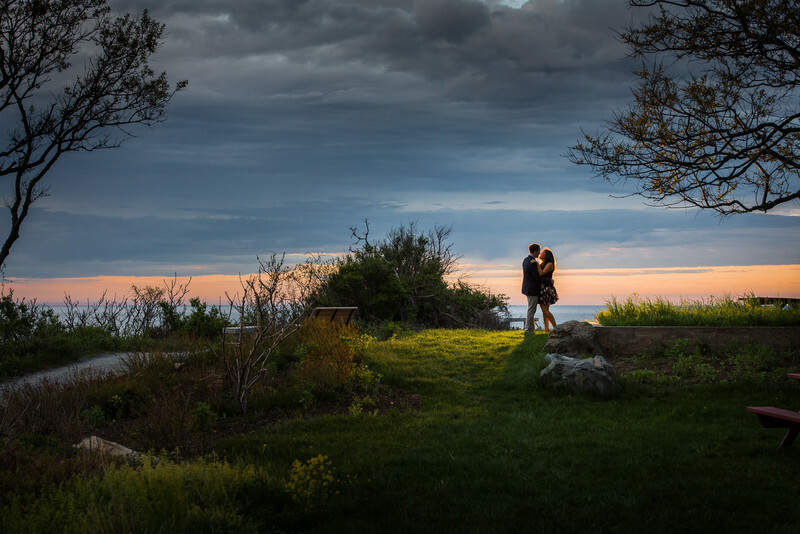 I met Jeremy and Lexy at Fort Williams Park in Cape Elizabeth for their engagement session. They just got engaged about a week prior flew all the way from Arizona to celebrate in the beautiful city of Portland Maine. Jeremy wanted some amazing images to memorialize their day and contacted the best wedding photographer in Maine.. Joshua Atticks (well someone's got to say it!!). Being from Cape Elizabeth, Fort Williams is a place very dear to be and I love showing guests from away. It never lets me down with it's sheer beauty and photographic options galore. Lexy and Jeremy were a blast to work with and naturals in front of the camera. I know this was going to be an awesome photo session and know I could really get creative with my photography. In that, this image was born. I found a gorgeous spot on the hill with the ocean in the back. Lexy and Jeremy were in just the right spot and I asked Lexy to kick her leg back to curve it up. But the light just wasn't good enough so out came my pocked sun, aka Nikon SB900. Bam, back light, gorgeous highlights and an image the really sings. This is photography at it's best. Keywords: cape elizabeth (45), couples (9), Engagement Session (72), Fort Williams (27), high end (3), Joshua Atticks (9), Joshua Atticks Wedding Photography (249), lighthouse (15), Maine engagement (45), Maine Photographer (9), photography (27), Portland Headlight (6), Wedding (51).